We understand what a business needs in order to attract customers via an online presence. What most small-medium businesses don’t understand is that there’s more to a website than just “design”. There’s mobility, search-ability, ease of use and ease of functionality. Preferred IT Solutions has the ability to provide Search Engine Optimization (SEO), a backbone that allows customers to update their page just as easy as updating Facebook and full social integration. We understand what a business needs in order to attract customers via an online presence. What most small-medium businesses don’t understand is that there’s more to a website than just “design”. There’s mobility, search-ability, ease of use and ease of functionality. Preferred has the ability to provide Search Engine Optimization (SEO), a backbone that allows customers to update their page just as easy as updating Facebook and full social integration. Our web design can include a fully responsive mobile site. Your customers will have access to all your website content, view your products, purchase products and even fill out forms all via their mobile phones/tablets.Our mobile webpages are compatible with iPhone, Android, Blackberry, Windows Phone and any mobile device that has a web browser. It’s truly better than an App and costs a fraction. Get that EDGE that can give you new business. Billions of people use Google’s Search Engine a day. We’ve mastered SEO and Analytics. Not only do we implement our own SEO coding, tags, data, etc into your page, but we also let you see the results through our Analytics Dashboard. Secure, Fast and Reliable web hosting by Preferred IT Solutions. We offer low cost plans that fit every businesses needs. From web site hosting to application hosting, we offer it all. 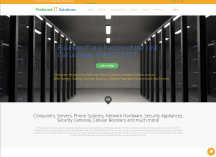 Preferred IT Solutions is a Pittsburgh-based IT company. We put integrity above all other values. We only employ experienced, knowledgeable technicians who share our beliefs and vision. Countless small business and medium businesses have relied on Preferred IT Solutions to keep their businesses running smoothly.